Torrenting has gotten a bad reputation in recent years and copyright holders and courts are forever blocking popular torrent sites. While it’s true there is a lot of legally questionable content available on Torrent networks the actual torrent system itself is not illegal and so blocking access to select resources seems to be a little heavy handed especially when a simple VPN can bypass such blocks. Finding a reliable VPN service to use with Torrents can be a lengthy process so I’ve been taking a look at a range of providers to bring you this updated list of Best VPN for Torrenting in 2017. Choosing a VPN service for torrenting starts with something as basic as checking that the service actually allows Torrent access. This may be listed as P2P or just directly as “Torrents” allowed but if the service you’re looking at doesn’t specifically mention they do allow access or they clearly state they don’t allow it then you know to avoid it. When considering a provider you should check out their logging policy. To stay safe you need to ensure that your provider does not log your actions and what you do while connected. It’s also a good idea to look for providers that offer Shared IP addresses. This means that when you connect you’re assigned an IP Address that other users are using, this makes it almost impossible to link what you download or your actions to yourself. There have been stories of providers who don’t offer Shared IP addresses such as VyprVPN banning people from their service after receiving a copyright complaint and being able to link the user by matching the download time to the time the user connected and disconnected. They also didn’t get any service refund so if you had 11 months of a 1 year service left then you could be seriously out of pocket. There may seem like a huge list of things you need to check first but not to worry because I’ve done the hard work for you. 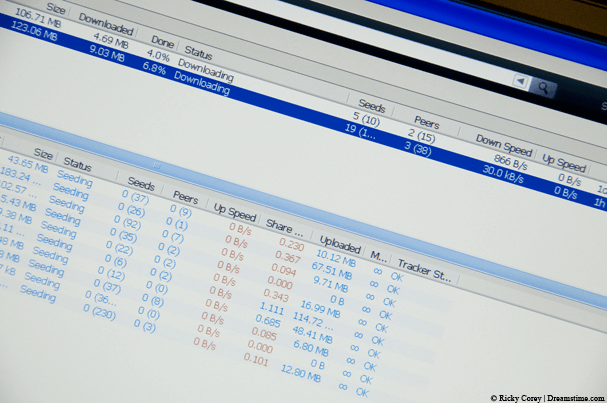 Just pick one of the 5 providers below and you can’t go wrong for torrenting. IPVanish is without a doubt the top choice for Torrenting. They clearly state one of the features of their service is “Unlimited P2P traffic”. This is important especially as many ISPs limit your speeds if you access P2P networks directly. You will never have your speeds slowed when connected which means you can download and seed at your maximum rate. Their no logs policy will ensure that what you download remains private so no one will know your download habits. Having servers in 60 different countries allows you to tunnel out of the restrictions of your own country. If a torrent site is blocked in your country then you can simply access another country and unblock that site. As well as the 256-bit encryption IPVanish also state that they support “anonymous torrenting” so you can’t ask for more than that. If you’re a little wary of VPN providers then ExpressVPN is probably your best choice. They have a massive 30-day money back guarantee allowing you to try the service with Torrents for a whole month and if you’re not happy then you can get a refund. The parent company is registered in the British Virgin Islands which technically makes them an “off-shore” VPN provider. This means they don’t need to follow the same rules as services based in more developed locations. No traffic logs are stored which means what you download and do while connected remains private and there is no history of your Torrent downloading. The software and apps are easy to use and they support all major systems including Linux which is a rare find. If you don’t mind trying a provider that you probably haven’t heard of before then VPN.ac is worth a look. Alongside IPVanish they’re one of the fastest providers I’ve tried and their download speeds are certainly one of the bonuses of the service. If you do a lot of torrent downloading or you just want to maximise your download speeds then they are certainly suited to the job. In the FAQ of their site they clearly state they do not block P2P or torrent protocols meaning you’re allowed to use them over the service. Although P2P is allowed across the entire network there are select servers that are optimised for P2P use and it’s one of few providers who do this. There are a couple of encryption modes available with VPN.ac that aren’t available from many other providers so they’re definitely worth considering. LiquidVPN are a lesser known provider but don’t let this put you off. They allow P2P and Torrent access across their entire network including locations such as the USA and UK. They publish a transparency report detailing all the copyright notices they’ve received but these never reach you the end user. They’ve even been known to close servers and move elsewhere when receiving notices related to Torrent downloads which shows the lengths they go to to protect their users. Speed on the service is great and they’re one of the fastest providers I’ve tested. One area that lets the service down is the lack of server choice, with just 10 countries covered the only thing you’ll need to consider is if they have a location near enough to you. Apart from that they offer an all round good service for Torrent and other use. PrivateInternetAccess is known all over the VPN industry and has millions of customers. It’s not for no reason that they’ve grown so big and with one of the cheapest prices available they’re definitely worth considering. PIA as they are otherwise known don’t care what you do on their network, they allow P2P and are known to champion many different privacy causes. The price is super cheap and on a yearly basis you’re unlikely to find any good providers cheaper. The only negative I could find is they aren’t as fast as the other choices. Apart from that though the service is good for torrenting and they state on their website they offer “P2P Support”. Is the free vpn Hola any good at all ? We have downloaded torrents through this and it seems virgin still are aware of a couple ? We really don’t recommend “free” VPN services, they aren’t secure, especially when it comes to downloading torrents. Thanks for the advice ? It looks like ipvanish is the way forward ? Be good to hear what you think. Any problems let us know and we’ll do our best to help.